US lawmakers re-introduced legislation in the Senate that’s aimed at allowing the government to bring lawsuits against OPEC members for antitrust violations. Lawmakers in the other chamber of Congress, the House of Representatives, already introduced a version of the “No Oil Producing and Exporting Cartels Act,” or NOPEC, bill in May. Congress has discussed various forms of NOPEC legislation since 2000, but both George W. Bush and Barack Obama threatened to use their veto power to halt it from becoming law. The risk for the Organization of Petroleum Exporting Countries is that U.S. President Donald Trump may break with this precedent. United States has the power to make OPEC subject to the first section of the Sherman Antitrust Act. The tricky part for US lawmakers is choosing a remedy for violations of the Sherman Antitrust Act by OPEC that won't do the very thing the law seeks to avoid: artificial restrictions on US supply that cause the price of oil to rise for the US. If the US bans OPEC imports into the US, then US supply drops and US oil price goes up. it would be counterproductive to subject OPEC to the Sherman Antitrust Act in order to reduce the US oil price. Doing so it would only raise the US oil price. They could, however OPEC could just deny sales of crude to the US. not going to happen. I am sure this is only President Trump negotiation tactic. Saudi Arabia should be worried about facing American antitrust laws while Russia is concerned that high oil prices are bad for consumers and encourage competitors to take market share. OPEC's main powers are more important militarily to future Middle East conflict with Iran than high oil. no need for regulation when it comes to other countries and manipulating their own prices. Seems to be that should be their right. 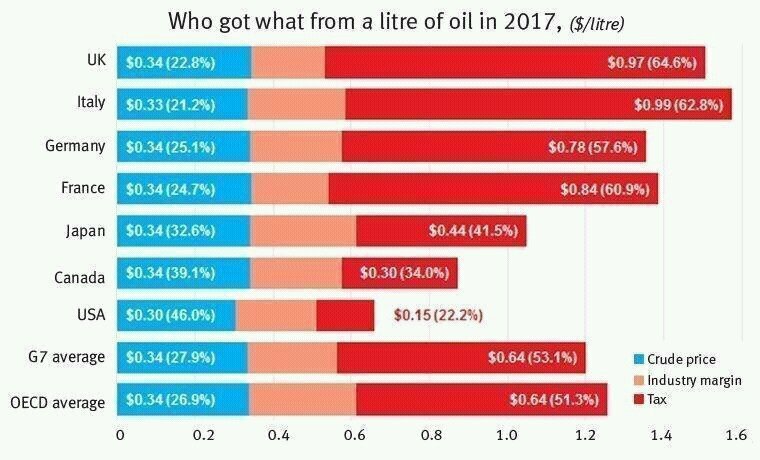 it's hardly Saudi Arabia's fault that we are reliant on them for their oil. I honestly can't see any scenario in which Trump agrees to this. There is a reason why former presidents declined to adopt this regulation. Trump may use this as another negotiating tactic, but he needs Saudi Arabia. this legislation, as always will be dead in the water. China is the largest importer now. The US produces too much oil. ^This. As much as I like the name NOPEC, and as much as I hope it will pass just because of that awesome name, the US simply has too much to lose should the legislation pass (such as the reduced economy resulting from higher cost of inputs, and also it would result in giving China too much leverage in the trade war). So it won't pass. The main problem with the US is that their citizens tend to elect halfwits to Congress who think ideas like NOPEC are good for US citizens. That's why they have been trying to pass trash like this for decades. Luckily, for the US, they have smarter people in charge than those who are elected. And these smarter people are why NOPEC will always "be dead in the water" ...at least until some genius invents a cost effective alternative to oil energy. isn't US telling the world of its energy independence? World is getting tired of arrogance and hypocrisy - can't wait to see US to be told where to stick these rules. Btw, China is the larges importer of crude. Kinda sorta. The US imports net approximately 2.7 mbpd. They get approximately 3 mbpd from Canada. So with much disruption and loss of refinery jobs the US needs no oil from anybody in the world but Canada. Most US imports are reshipped for profit while eating the pollution. In a couple years the US may not even need Canadian oil except for trading light for heavy. This gives Trump the leverage to play hard ball. N America is basically net oil independent. The Organization of Petroleum Exporting Countries is an intergovernmental organization that has the same rank as the United Nations or by that matter, the Organization of American States (OAE). It also has rank as a sovereign international organization that could not be bidden to any country law, inclusive the US. I think the US must revise its Sherman antitrust Law to disintegrate EXXONMOBIL, CONOCOPHILLIPS or CHEVRON which are truly trust that play a very important role in the geopolitical price swings. There is also something called international law. Im lawyer and I would like to remind you US has no right to use secondary sanctions and internal american law outside US jurisidiction. Attorney Tomasz may well have a point (as to the applicability of or extension of US laws and Courts to the affairs of other nations), but I point out to the forum that the US District Courts have long shown disinterest in those theories. The US has long simply extended its reach and jurisdiction to the far corners of the globe. As just one tiny example, the descendants of European Jews who put their cash into Swiss Banks and then died in Nazi camps were rebuffed when they attempted to go collect those deposits from the Swiss - who demanded a "Death Certificate" before releasing anything. So, since when did the Nazis issue death certificates to Jews? They can do but they can can only examine the process and whether it meets regulatory requirements for setting taxes, not challenge the actual amount.